talkhealth > Blog > 2015/08 > Wheat or gluten free beer at the CAMRA beer festival? I’m asking a question here because I’m not quite sure. I’m planning a visit to London with colleagues tomorrow and received this very helpful response from CAMRA about whether there would be any wheat and/or gluten free beers available. Last year there was ONE beer! And very nice it was too. I had quite a lot of it. “We would say there would be at least 3 real ales and some international beers. All bars will have an allergen list. So these beers may or may not be there… I’ll let you know. Some of these may be available in bottles or may be on tap… it’s not clear here. 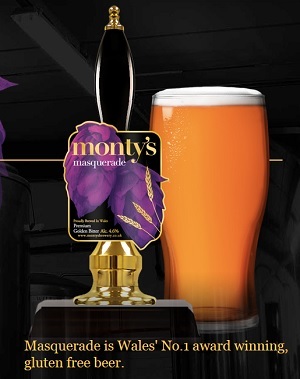 I can tell you from first hand supping, Monty’s is very, very nice ale. I think I have also had Wold Top before – again top beer. Get there quick as they usually run out of many beers before the week is out. If these three beers are in fact present at the CAMRA Real Ale Festival in London this week this will be a 200% increase on what was provided last year. Not bad but still not brilliant. I hope I can find them amongst the hundreds on offer. And to all you real ale drinkers out there – hands off the gluten free beer – it’s just for us wheat allergics and coeliacs. You can try a half but then get back to your wheaty ales. But don’t forget, there will be more cider than you can possibly dream of, so if the beer lets you down, you know what to do. Eat plenty before you go as there probably won’t be any freefrom snacks available!